March has finally come to an end and so has my "March Madness", and I have this loot to show for it. As you can all see this month is almost all games with a couple of manga volumes. The main reason for that is delays, Alter's Yui got pushed to April, so did Gift's Reimu and by extension Stand By Nanoha that was going to ship with her. 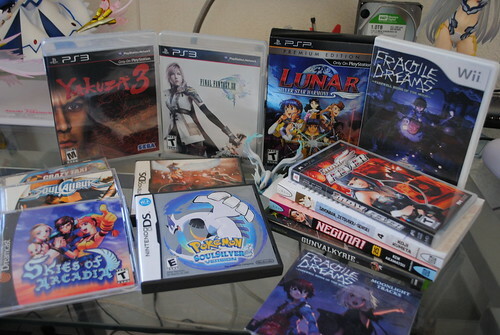 Besides, I'm a gamer first and foremost and my figure collecting can and has taken a back seat to my gaming hobby. I got a few things to say about some of these games. First up is Fragile, I been wanting for this game to be released since I saw it at a TGS a few years back. What caught my attention was the atmosphere of the trailers and the theme song. I will admit I have yet to play this game; however, what I have heard is making look forward to it. In particular Pete Dorr over at Youtube said something quite interesting, he compared the story and atmosphere being similar to 5cm per second and Voices of a Distant Star. If you watch anime you probably you heard of Makoto Shinkai and his acclaimed films and know they are worth watching. Just with that comment it made my already high interest go even higher. 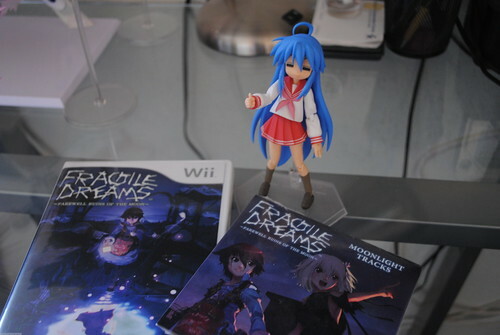 One last thing, again contrary to popular belief the Wii does indeed have games worth while playing Fragile is one of those games in my opinion. 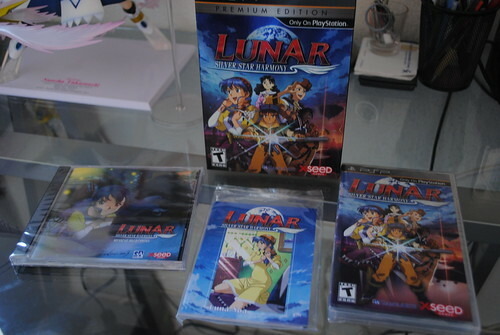 Next up is the PSP Lunar Silver Star Saga remake Silver Star Harmony. If you played games and RPGs in the 90s then you probably know or heard of this amazing Sega Saturn RPG and it's later legendary release by Working Designs for the PSOne. I heard so much about this game that I been wanting to play it for a while. Never really owned a PSOne until its last couple of years and rarely indulged myself in PSOne games. Add to it the high price the PSOne release carried back then and I never played this game. Luckily for me, xseed brought this over and I bought the special edition that includes the game, the soundtrack and trading cards depicting the some of the female characters from the game. I'm looking forward to playing this. These three games should need no introduction. 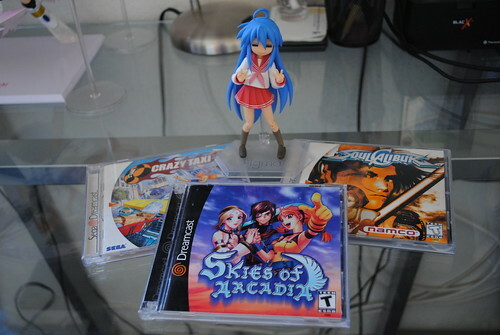 This month for some reason I got this urge to buy some Dreamcast games. Funny thing is, I already own Skies of Arcadia and Soulcalibur on the Gamecube and Xbox 360 respectively and owned Crazy Taxy and sold it. I have played through Skies of Arcadia three times, and the last time I did it was a nearly 100% run. Even so, I find owning the original version of this RPG appealing. This is probably one of the best RPGs of the past decade if you haven't give it a go. As for Soul Calibur, I prefer this over SC4 on the PS3 and 360 although SC2 on the Gamecube is my favorite in the series. The one released for the 360 already came with everything unlocked so there is not really not much for me to do in that game other than playing against other people. I must say the original Soul Calibur is still fun and looks great on the Dreamcast. If you haven't played the original and liked later incarnation I suggest picking it up on the 360 if you are able to. 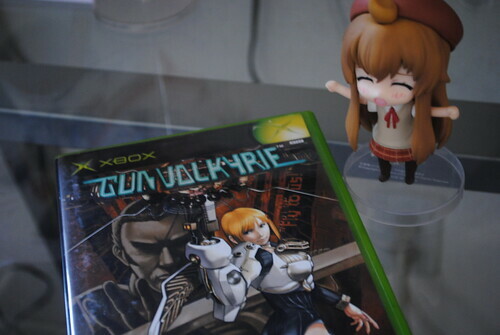 The last game I want to talk about is GunValkyrie for the original Xbox. I liked what I read about it over at the racketboy about its difficulty and gameplay add that this game is dirt cheap and I had to pick it up. You may wonder why I added Chiaki-sama to the picture, the reason being is that that's how I feel about this game. The reason behind that is that I don't own an original Xbox only the 360. The Xbox 360 does not offer full backwards compatibility since it uses software emulation. You can probably guess what happened, my 360 cannot play this game. Therefore, until I obtain an original Xbox I probably wont be able to play this game. That's my rant about this loot, don't forget I finally got into Twitter and you can follow me to know when I make new posts @Miettechan.